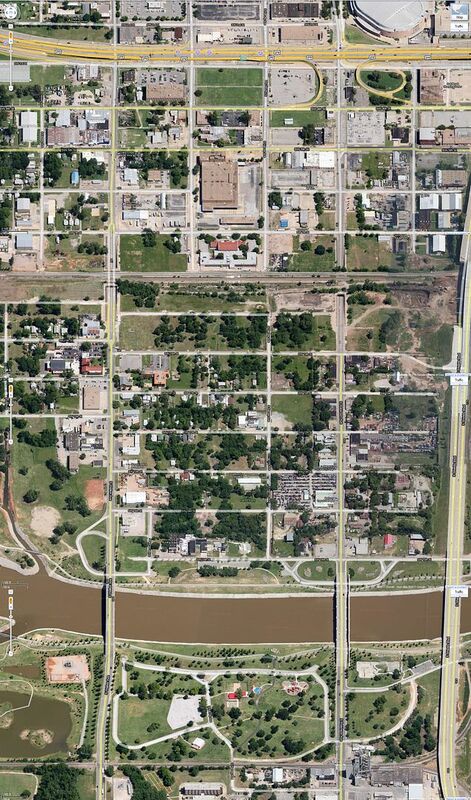 The Downtown Public Park consists of a 40-acre upper section and a 30-acre lower section connected by the SkyDance Bridge that spans the relocated Interstate 40 Highway. The upper park is generally within the boundaries of Hudson Avenue on the west, Robinson Avenue on the east, the future Boulevard on the north (SW 3rd St.) and the new I-40 on the south. The lower park is generally within the boundaries of Walker Avenue on the West, Robinson Avenue on the east, the new I-40 on the north and SW 10th Street on the south, with an additional section bounded by Harvey Avenue on the west, Robinson Avenue on the east, SW 10th street on the north and SW 15th Street on the south. 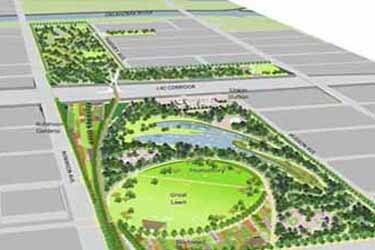 The Downtown Public Park extends across the relocated I-40 corridor. This will establish park activity south of I-40 (reaching toward the Oklahoma River), and an active southern landing area for the Skydance Bridge, thereby helping to mitigate the barrier effect of the new I-40. The development of an overall Master Plan and design and construction of the first phase of the upper section which may include basic amenities such as developing an edge with the new Boulevard and the access to the SkyDance bridge. The second phase will include amenities related to the planned programming for the upper section of the park. The lower section will be completed in the final phase and may be less programmed than the upper section. Amenities included in each phase will be determined by the available budget and will be addressed during the Master Plan for the Downtown Public Park. The Downtown Public Park will become the signature open space of the City’s Core to Shore plan - a 750 acre redevelopment plan which was envisioned to build and connect a series of neighborhoods, parks, and economic opportunities that will reinvent downtown Oklahoma City, leading to new jobs and a higher quality of life for residents. The park will also form an integral connection component of a larger downtown open space system that includes the river edges, the Myriad Botanical Gardens, Bicentennial Park and other public and private open spaces. The 40 acres of the park north of the new I-40 will be acquired and cleared, preserving as many trees and historic structures as possible. A former U.S. Federal Post Office facility on the site has been demolished along with other residential and commercial properties. 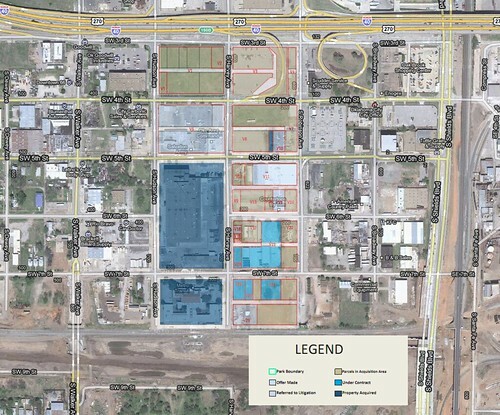 Acquisition of the 30 acres for the lower section of park south of the new I-40 is scheduled to begin in 2014. The new Downtown Convention Center is currently planned to be located directly north of the Downtown Public Park on the other side of the proposed Boulevard. The Convention Center design is scheduled to begin in 2014 with construction to begin in 2016. An electrical substation is located across the street from the northeast corner of the Downtown Public Park. There has been discussion about possible means of mitigating the impact of the substation on the Downtown Public Park, including various methods of screening it from view. Options for such mitigation, if deemed necessary, should be included in the Master Plan. It's one of these right? UnFrSaKn, the second one is good for me, thanks. First link in post #5 works but it's not a map and all the other ones blow like WWLS! I was bored, so here's a giant map of the area via Google Maps. Is there a way to highlight the areas that have been acquired? Does anyone know if the old postal facility has been demolished yet? Last time I went by the old post office, about ten days ago, there were big holes in the east side walls, but the building was still standing. It was done as conceptual spacing, it did not over lay well with an actual map. had to distort the blocks to fit in actual grid. Do you have a reason to believe it is? Do we know what they have paid for properties vs. appraised value? Is there a report anywhere? Probably just as much reason to believe either way..do you think the Post Office and Goodwill sites were worth the $6 million or so that were paid for them (considering the building had to be removed, cost of environmental etc etc.)? The last property they are acquiring cost a little over $300,000. I can't tell if it's an entire block but it looks as if it's multiple properties. That doesn't sound so bad. Yes, there were some concerns earlier about C2S that the city would not use eminent domain and that property owners were taking advantage of that by hiking up their asking price to leave. I think the city paid too much for the post office and goodwill. Goodwill absolutely took the city to the cleaners, or to the goodwill in this case lol. Great pics! I drove by the other day, but didn't have a camera. Good grief, this thing has been under demolition for months. I'm anxious to see the vistas of Union Station when it is completely removed.